Is it possible to implement the model–view–controller pattern in Java for Android? Or is it already implemented through Activities? Or is there a better way to implement the MVC pattern for Android? You define your user interface in various XML files by resolution, hardware, etc. You define your resources in various XML files by locale, etc. You extend clases like ListActivity, TabActivity and make use of the XML file by inflaters. You can create as many classes as you wish for your business logic. A lot of Utils have been already written for you - DatabaseUtils, Html. Also think about it this way: When you program your model, the model should not need to worry about the rendering (or platform specific code). The model would say to the view, I don't care if your rendering is Android or iOS or Windows Phone, this is what I need you to render. The view would only handle the platform-specific rendering code. This is particularly useful when you use Mono to share the model in order to develop cross-platform applications. The actions, views and activities on Android are the baked-in way of working with the Android UI and are an implementation of the model–view–viewmodel (MVVM) pattern, which is structurally similar (in the same family as) model–view–controller. To the best of my knowledge, there is no way to break out of this model. It can probably be done, but you would likely lose all the benefit that the existing model has and have to rewrite your own UI layer to make it work. View = layout, resources and built-in classes like Button derived from android.view.View. The most reasonable thing for a small developer is to follow this pattern and not to try to do what Google decided not to do. PS Note that Activity is sometimes restarted, so it's no place for model data (the easiest way to cause a restart is to omit android:configChanges="keyboardHidden|orientation" from the XML and turn your device). 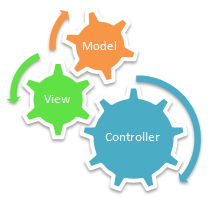 We may be talking about MVC, but it will be so to say FMVC, Framework--Model--View--Controller. The Framework (the Android OS) imposes its idea of component life cycle and related events, and in practice the Controller (Activity/Service/BroadcastReceiver) is first of all responsible for coping with these Framework-imposed events (such as onCreate()). Should user input be processed separately? Even if it should, you cannot separate it, user input events also come from Android. Anyway, the less code that is not Android-specific you put into your Activity/Service/BroadcastReceiver, the better. There is no single MVC pattern you could obey to. MVC just states more or less that you should not mingle data and view, so that e.g. views are responsible for holding data or classes which are processing data are directly affecting the view. But nevertheless, the way Android deals with classes and resources, you're sometimes even forced to follow the MVC pattern. More complicated in my opinion are the activities which are responsible sometimes for the view, but nevertheless act as an controller in the same time. If you define your views and layouts in the XML files, load your resources from the res folder, and if you avoid more or less to mingle these things in your code, then you're anyway following an MVC pattern. You can implement MVC in Android, but it is not "natively supported" and takes some effort. I have also posted a more detailed answer here. After playing with the various approaches to MVC/MVP implementation in Android, I came up with a reasonable architectural pattern, which I described in a this post: MVP and MVC Architectural Patterns in Android. I followed the same design for one of my projects, and it worked great. I am a beginner on Android, so I can't say that this is the best solution. I made one modification: I instantiated the model and the controller for each activity in the application class so that these are not recreated when the landscape-portrait mode changes. I agree with JDPeckham, and I believe that XML alone is not sufficient to implement the UI part of an application. However, if you consider the Activity as part of the view then implementing MVC is quite straightforward. You can override Application (as returned by getApplication() in Activity) and it's here that you can create a controller that survives for the lifetime of your application. Activity can play the role. Entity like - user, Product, and Customer class. methods for helping format and validation code. Now here is the piece of magic you can do. Once you have classified the piece of code, write a base interface class like, IEntity and IService. Declare common methods. Now create the abstract class BaseService and declare your own set of methods and have separation of code. NOTE 2: If your activity is presenting multiple models then rather than writing the code/logic in activity, it is better to divide the views in fragments. Then it's better. So in the future if any more model is needed to show up in the view, add one more fragment. NOTE 3: Separation of code is very important. Every component in the architecture should be independent not having dependent logic. If by chance if you have something dependent logic, then write a mapping logic class in between. This will help you in the future. An Adapter object acts as a bridge between an AdapterView and the underlying data for that view. I'm just looking into this for an Android application that reads from a database, so I don't know how well it works yet. However, it seems a little like Qt's Model-View-Delegate architecture, which they claim is a step up from a traditional MVC pattern. At least on the PC, Qt's pattern works fairly well. android-binding - Providing a framework that enabes the binding of android view widgets to data model. It helps to implement MVC or MVVM patterns in android applications. roboguice - RoboGuice takes the guesswork out of development. Inject your View, Resource, System Service, or any other object, and let RoboGuice take care of the details. When we have to main large projects in the software development, MVC is generally used because it’s a universal way of organizing the projects. Helps in development of big projects and cross platform too. View: How it’s displayed. This can be the xml. It is thus acting as a presentation filter. A view is attached to its model (or model part) and gets the data necessary for the presentation. From everything else I've seen and read here, implementing all these things makes it harder and does not fit in well with other parts of android. Having an activity implement other listeners is already the standard Android way. The most harmless way would be to add the Java Observer like the slides describe and group the onClick and other types of actions into functions that are still in the Activity. The Android way is that the Activity does both. Fighting it doesn't really make extending or doing future coding any easier. I agree with the 2nd post. It's sort of already implemented, just not the way people are used to. Whether or not it's in the same file or not, there is separation already. There is no need to create extra separation to make it fit other languages and OSes. Basically, you have a component (activity, fragment, and viewgroup). Inside you define the structure and style of the view layer. Also you define how data should be bound to the views. Finally, you can bind listeners in the same place. Then, once your data is changed - the global "render()" method will be called, and your views will be smartly updated with the most recent data. Here's an example of the component having everything inside for code compactness (of course Model and Controller can be easily separated). Here "count" is a model, view() method is a view, and "v -> count++" is a controller which listens to the button clicks and updates the model. Here on each button click the number will be increased, then "render()" will be called, and button text will be updated. The syntax becomes more pleasant if you use Kotlin: http://zserge.com/blog/anvil-kotlin.html. Also, there is alternative syntax for Java without lambdas. The library itself is very lightweight, has no dependencies, uses no reflection, etc. It was surprising to see that none of the posts here answered the question. They are either too general, vague, incorrect or do not address the implementation in android. In MVC, the View layer only knows how to show the user interface (UI). If any data is needed for this, it gets it from the Model layer. But the View does NOT directly ask the model to find the data, it does it through the Controller. So the Controller calls the Model to provide the required data for the View. Once the data is ready, the Controller informs the View that the data is ready to be acquired from the Model. Now the View can get the data from the Model. 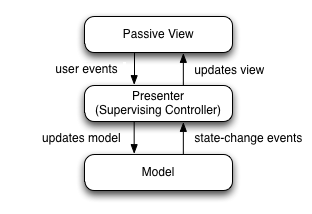 It is worth noting that the View can know about the availability of the data in the Model either through Controller -- also known as Passive MVC -- or by observing the data in the Model by registering observables to it, which is Active MVC. On the implementation part, one of the first things that comes to mind is that what android component should be used for the View? Activity or Fragment ? The answer is that it does not matter and both can be used. The View should be able to present the user interface (UI) on the device and respond to the user's interaction with the UI. Both Activity and Fragment provide the required methods for this. In the example app used in this article I have used Activity for the View layer, but Fragment can also be used. The complete sample app can be found in the 'mvc' branch of my GitHub repo here. I have also dealt with the pros and cons of MVC architecture in android through an example here. For those interested, I have started a series of articles on android app architecture here in which I compare the different architectures, i.e. MVC, MVP, MVVM, for android app development through a complete working app. There is not an implemented MVC architecture, but a set of libraries / examples exists to implement an MVP (model–view–presenter) architecture. The model on Android is simply the parcelable object. 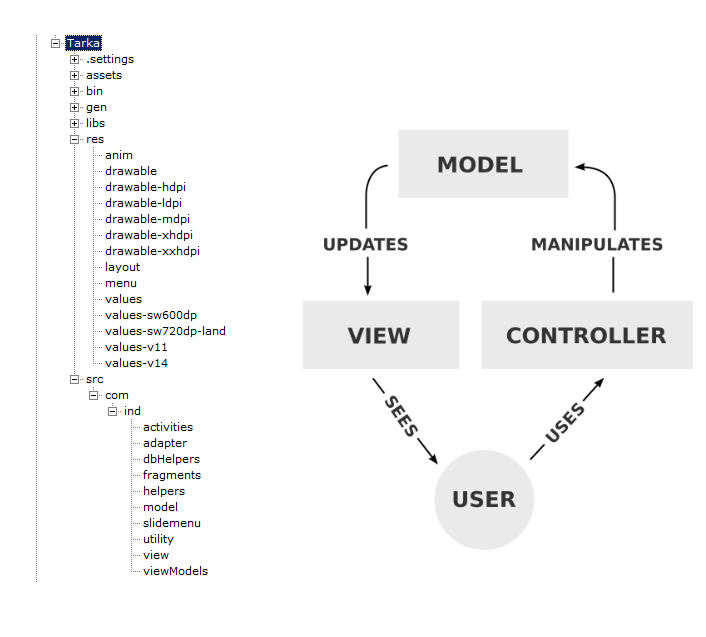 The view is the XML layout, and the controller is the (activity + its fragment). *This is just my opinion, not from any resource or a book. I have seen that many people are saying MVC is already implemented in Android, but it's not true. Android follows no MVC by default. Because i don't Google will ever forcefully impose the restrictions of an MVC implementation like iPhone, but its upto the developers which patteren or technique they want in their project, In small or simple applications use of MVC is not required, but as the application grows and get complicated and require modification's of its code in later years, then there comes a need of the MVC pattern in Android. It provides an easy way to modify code and also helps in reduction of issues. If you would like to implement MVC on Android, then follow this below given link and enjoy the MVC implementation in your project. But nowadays i think MVP along with Android Architectural Pattern is one of the best option developers should use for a clean and robust android applications. When we apply MVC, MVVM, or Presentation Model to an Android app, what we really want is to have a clear structured project and more importantly easier for unit tests. At the moment, without a third-party framework, you usually have lots of code (like addXXListener(), findViewById(), etc. ), which does not add any business value. What's more, you have to run Android unit tests instead of normal JUnit tests, which take ages to run and make unit tests somewhat impractical. For these reasons, some years ago we started an open source project, RoboBinding - A data-binding Presentation Model framework for the Android platform. RoboBinding helps you write UI code that is easier to read, test and maintain. RoboBinding removes the need of unnecessary code like addXXListener or so, and shifts UI logic to Presentation Model, which is a POJO and can be tested via normal JUnit tests. RoboBinding itself comes with more than 300 JUnit tests to ensure its quality. Not the answer you're looking for? Browse other questions tagged java android design-patterns model-view-controller or ask your own question. Which design patterns are used on Android? Does Android supports MVC (Model View Controller) Structure? What are MVP and MVC and what is the difference? What is the difference between MVC and MVVM?